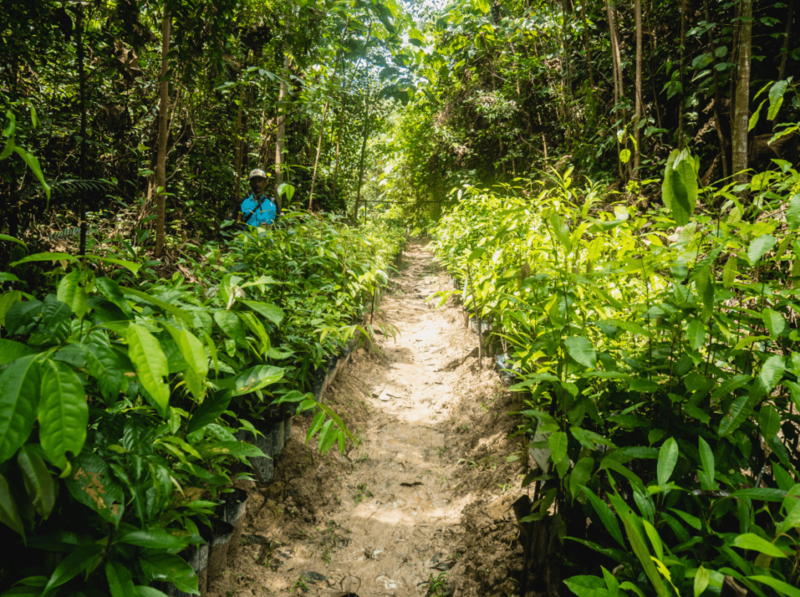 In Jambi province, Central Sumatra, Partnerships for Forests is supporting the development of a conservation area to ensure a pioneering sustainable natural rubber plantation delivers sustainable development impacts. The 400,000-hectare Bukit Tigapuluh (BTP) landscape is one of the last remaining fragments of lowland tropical forest in Sumatra and one of the world’s most precious ecosystems and wildlife habitats. Around half of the forest has been lost over the last 20 years – while the populations of critically endangered mammals face threats arising from poaching, human-wildlife conflict and hunting of prey species. Major underlying problems in the landscape include a lack of patrols and monitoring, and lack of alternative, sustainable business models meaning there is no economic sustainability for long-term protection of the forest. PT Royal Lestari Utama (RLU) are pioneering an innovative model in nature conservation as well as developing a socially inclusive rubber plantation, which will transform a heavily degraded landscape into a productive area through reforestation and sustainable rubber. WWF-Indonesia and RLU are supported through the Partnerships for Forests programme to manage this innovative approach to develop a responsible business that includes protecting its endemic population of critically endangered Sumatran elephants. In partnership with WWF-Indonesia the support will establish and restore the Wildlife Conservation Area within the landscape which is an area critical for joining up areas of land in the BTP landscape and acting as a buffer zone between production landscape and the BTP National Park. We are supporting the development and implementation of a ‘Human-Elephant Conflict Mitigation Procedure’ which aims to reduce wildlife conflicts in the area which can often result in the loss of lives of people and wildlife and loss of crops in village smallholdings. This work will also support the process of getting the Wildlife Conservation Area included in the upcoming 10-year National Elephant Conversation Plan. Elephant footprints, Sumatra. Picture: Partnerships for Forests. Activities supported include: monitoring and supporting protection of the remaining natural forest in partnership with the BTP National Park and law enforcement agencies; protecting the conservation area through a community-based framework agreement and development of sustainable land use management; and establishing a management unit for the conservation area. The partnership will enhance the livelihoods of ±50,000 people in 18 villages through increased income from legal and sustainable rubber and Non-Timber Forest Product businesses, natural forest restoration and protection activities, and improved access to health and education. Larger and improved habitat for elephants and all other wildlife ‘under their umbrella’ e.g. tigers and orangutans. The integration of conservation with rubber development has allowed PT Royal Lestari Utama to secure green commercial finance of US$95 million, bringing 88,000 hectares of the wider Bukit Tigapuluh Landscape under improved and sustainable management.